(I Heart Intelligence) The universe can be a funny place sometimes. I’ve been doing a lot of research about a form of mental abuse that a lot of us are not only susceptible to, but actually deal with every single day. It is one of those things that we don’t even realize is happening to us, we just see the results: self-doubt, diminished self-esteem, and reduced self-worth. The world has a way of beating even the best of us down from time to time but this specific form of manipulation is one that can be identified and removed from our day-to-day existence. In the play, the key was the husband’s ability to alter the wife’s perception of reality. She saw the lamp as being dimmer and the husband assures her that it is not. He made he doubt her perception, and therefore her reality. It is a form of mental abuse that people too often don’t even realize what is happening to them. For the perpetrator, the ability to control the victim’s own perceptions of themselves and the things around them allows them to control the victim themselves. In reality, it happens every single day. It’s all around us. How many advertisements do you see that claim that using their product will somehow enhance your life? That’s a mild form of gaslighting. You are made to think that some aspect of you or your life is incomplete. You are made to DOUBT yourself. Further, you are made to think that whatever product is being peddled is the solution to what is supposedly lacking in your life. The specific situation that inspired this article involved one of the most beautiful and amazing women I have ever known dealing with a break up from a man that never deserved to be with her in the first place. I explained to her that there are people in our lives who will try to break us down to be on their level . 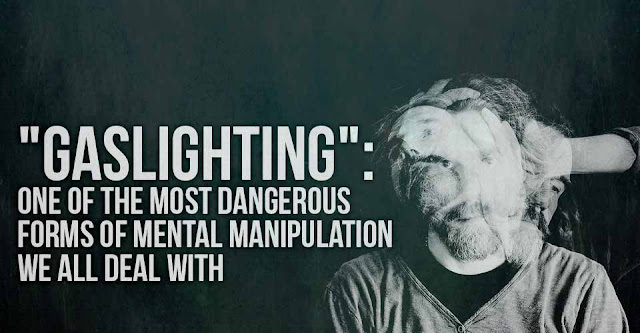 So, what is the answer to gaslighting?